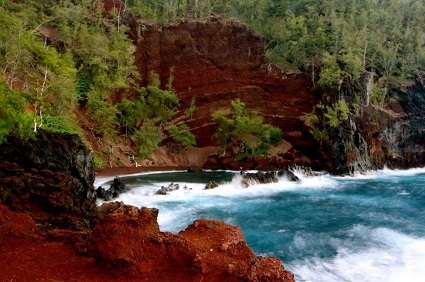 Red: – At the end of Maui’s Road to Hana lies Kaihalulu Beach, this beach is also known as Red Sand Beach. The beach is surrounded by red cliffs, and the contrast of the blue water against the colorful landscape is simply stunning. Orange: – It is naturally peaceful too. Located on the North-East coast of the Island, San Blas Bay lies at the end of one of the most beautiful fertile valleys of Gozo, with no buildings to barr the view. Yellow/Golden: – The golden sands at Papohaku Beach Park on the Hawaiian island of Molokai are mesmerizing. When the sun sets, the golden light on those golden sands is quite a sight. 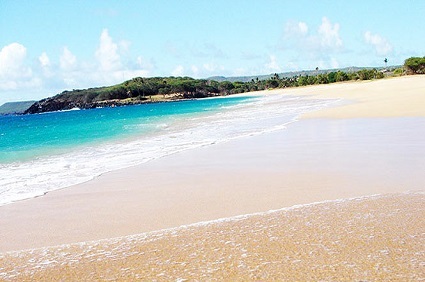 Green: – On the east coast of Guam lies Talofofo Beach, one of only a handful of green sand beaches in the world – the others are on the Big Island of Hawaii, the Galapagos Islands and Norway. 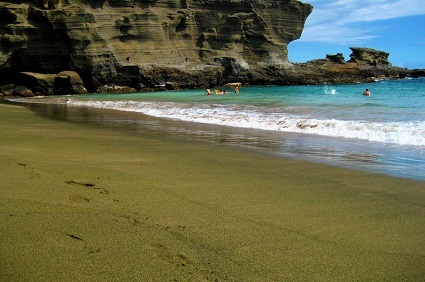 The green sand on Talofofo Beach gets its color from the olivine mineral, a product of the island’s lava flow. Blue/Indigo: – While the sand itself isn’t blue, it does take on the saturated hue from the phytoplankton that’s strewn across Vaadhoo Island in the Maldives. 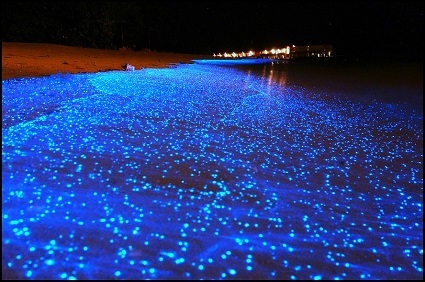 The bioluminescence lights up the night, creating a spectacular natural scene. Violet: – After a short drive through a redwood forest in Big Sur, you’ll find Pfeiffer Beach. 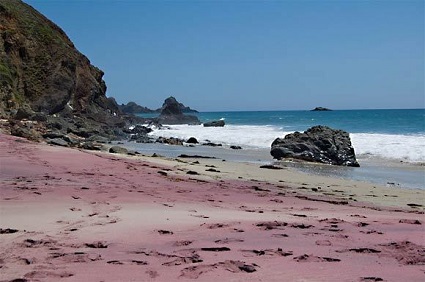 The color of the sand on the beach isn’t purple or violet, there are patches on the northern coastline of the beach that are, which make for a pleasant discovery. 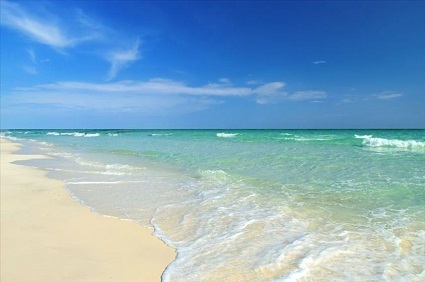 White: – Just outside Sarasota, Fla. lies Siesta Key, with some of the whitest, softest sand in the world. The sand is 99 percent pure quartz, which means it stays nice and cool even on the hottest of Florida summer days. 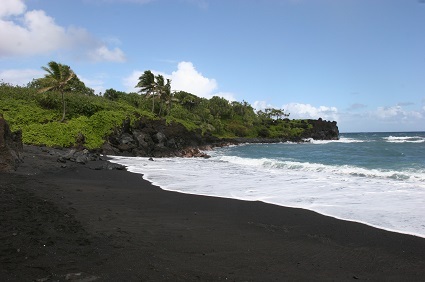 Black: – Lava particles that have found their way to the beaches in Costa Rica create dramatic, black sand beaches that are incredibly captivating. One of the more popular black sand beaches in the Central American country is Playa Negra in Limon, on the Caribbean coast. Now, what are you waiting for? 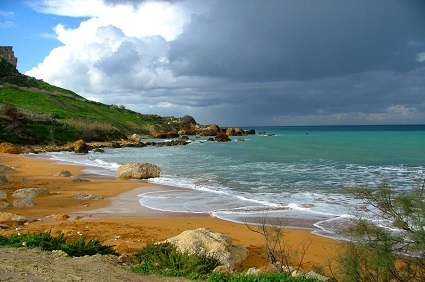 Visit these amazing beaches this year. Travelation offers you huge discount on airfares for worldwide destination. Check out our all travel deals here: http://www.travelation.com/ also you can call us toll free number @877-247-7183 to get extra benefits.